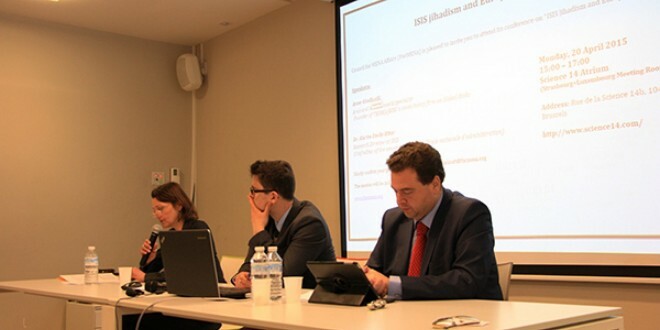 Council for MENA Affairs (ForMENA) held a conference entitled “ISIS, jihadism and the threats to Europe” in Brussels on Monday, 20 April, 2015. The event was the last of a series of conferences that ForMENA has organized to discuss various aspects of the Islamic State. To kick off the conference, Sébastien Boussois, Policy Advisor for ForMENA, welcomed the attendees and provided an overview of  ForMENA’s goals and activities across Europe, before introducing our guest speakers: Anne Giudicelli, an Arab and Muslim world specialist and founder of TERR(o)RISC, a consultancy firm advising on global risk, and Dr. Karim Emile Bitar, Research Director at IRIS and Chief Editor of the news magazine ENA (Ecole nationale d’administration). The conference was attended by about 30 representatives of European organizations and institutions, including officials from the Belgian Foreign Ministry, members of the European Parliament, representatives of diplomatic corps of Arab and European countries a strong and media and press presence. ForMENA will publish more information about the results of its three conferences on ISIS and Europe in the near future.